You coward! unlike you I do appreciate the Black Race. I would never write derogatory comments as you have. You have your nerves to sign my name to it. You know what? You have to try a little bit harder to imitate my English. Go back to school, jerk. I think this 3 haitian Young Guys should truthly appriciated. they have talent, knowledge, and tone of skills. Hope their don't prayer from no one, that might come and tells them story. 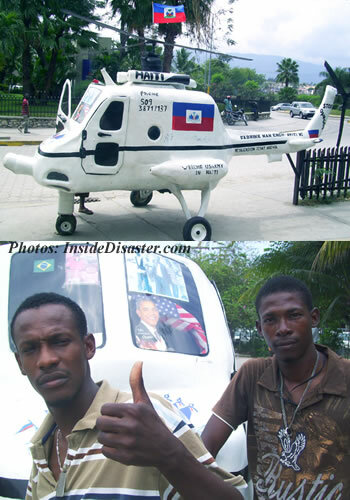 Great Job my fellow Haitian Brother. Se byen sa mesye bon travay, se yon istwa kap rete grave nan lespri tout Haitien, toujou mande bon Dye pou ban nou plis entelijens pou nou kapab ale pi devan, nan konesans ak enterlijens li ban nou an, map ede nou prye afin ke pou bon Dye ban nou plis entelijens toujou. Ca ce youn gran akomplisman. I support those young gentlemen 100% in continuing their education, It is understandable that Helicopters have been around and the kits are availlable, but it takes a lot of efforts to put that kit together.